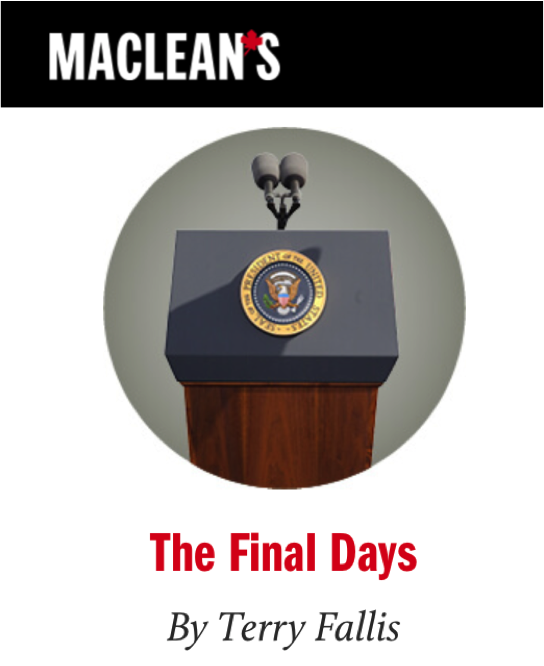 The folks at Maclean’s asked a few writers to speculate on how the Trump presidency might end. Here’s what I came up with. A two-time winner of the Stephen Leacock Medal for Humour, Terry Fallis is the award-winning author of six national bestsellers, including his latest novel, One Brother Shy, all published by McClelland & Stewart. It’s really not part of my job description, but no one else will do it. And there is a certain logic to it, I guess, given that I’m the one closest to him—physically, I mean. But I should earn even more danger pay than I already get for this little add-on to my duties. He rolled over in the dimness—the light in the room, I mean—and I saw poking from beneath the sheets a whoosh of golden hair that looked like the Statue of Liberty’s torch, only brighter. “No, no. You know what I mean,” he croaked. A small orangey fist emerged from the sheets and hammered the mattress four or five times accompanied by a noise that I wouldn’t have believed was created by a human had I not been standing right next to him. He pulled down the sheets, mercifully to just below his chin. His hair went madly off in all directions but I could see his shining eyes and a look of hope flashed on his face like a pulsing neon restaurant sign. I waited as he studied the ceiling. “Are you my butler or something?” he asked. I pulled it out and held it up so he could see it, again. The Joint Chiefs weren’t happy. And Mike Pence was in for the shock of his life, even though the President had severely depleted his VP’s capacity for shock. Mike Pence already felt shocked out. But he wasn’t. Not quite. When I slipped back into the presidential bedroom, or what we in the Secret Service call the POTUS Pad, the President was sitting up in bed wearing a fluffy terrycloth robe with the Presidential seal on one side and the Trump corporate logo on the other. He was leafing through Sports Illustrated. It was the same issue he’d been “reading” for several weeks already, the annual swimsuit edition. “Ivanka could totally be in here. No problem. Done deal,” he said, waving around the magazine. I headed to the White House kitchen as the Vice President slipped into the room. Three days later, you can see me on television, standing behind and to the left of the President, as he and Vice-President Pence stood at the lectern in the Rose Garden. My darting eyes shielded by sunglasses, I surveyed the gobsmacked faces of the press corps. There was no teleprompter and no speaking notes. Never a good sign. “My fellow Americans, I took office 18 months ago when America was in serious trouble. It was a disaster. Since then so much beautiful stuff has happened, and all of it good for the country. I promised to win the election against that mean woman, Hillary Clinton, and I did. I promised to repeal and replace ObamaCare, and well, we were almost there before John McCain and those two witches killed it. But that’s not my fault. I promised to create more jobs in this country, and just look how many different people have worked on my staff since then. Lots of jobs. The best jobs. I’ve stood up for America on the world stage. All the other leaders love me even more than that Justin Trudel guy. It’s fantastic. I promised to make America great again, and I have. “Pence!” the Vice President hissed from the corner of his smiling mouth just loudly enough for everyone in the Rose Garden to hear, and several who weren’t. “Pence, Mike Pence, will take over as President according to the Constitution of the United States. So, over to you, Mike. Don’t you mess up all the good work I’ve done. Get that wall built. And give my best to the Boy Scouts because I won’t be speaking at their big jumbalay thingy this year, you will be. And they love me. They really do. You should have seen them last year. It was beautiful. Okay folks, write whatever the hell you want, I am out of here as soon as Marine One is warmed up.